Check Info folder for new features availables and pics as example. Check out also at not available features. You can now edit leagues structures and teams. just switch already present teams with Replace function in Leagues (CM16). Are you able to switch teams in CM like the example mod included in pics? Never change the total numbers of teams in leagues. Take care…..
otherwise you can go out of range in game. ..include Germany League 3 ready to use and now visible in CM but empty atm. UPDATED pics in Info folder. – Run CM16DB18_FULL_0.6_[D+].exe to enjoy new features. go in 18_IMPORT folder, delete or rename tables you don’t want to import in your 18 db. Include also a fast importer and exporter available to run without conversion step. run 18_IMPORT_ONLY, wait for your new full main DB.db. players, ok??? 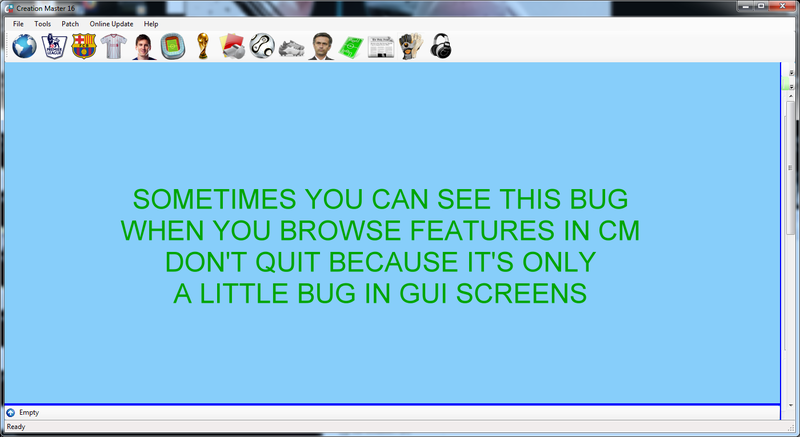 Populate columns like composure, etc, this is required just once. For how to adjust BASE Templates check in this document (from 0.1). and in some click the tool provide to extract and convert tables and import in a 18 database. template to inject in db tables, full customization tool interface, and total 100% conversion. 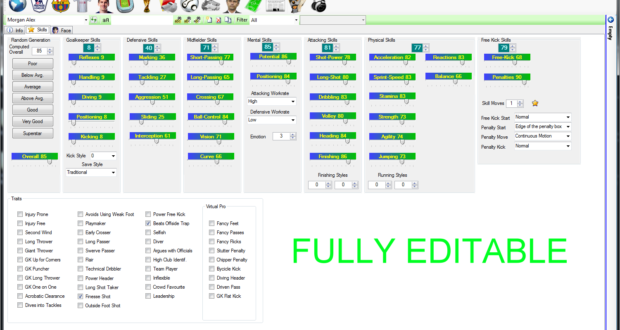 The database in the pack ready to edit include latest squads update and you can start to edit. 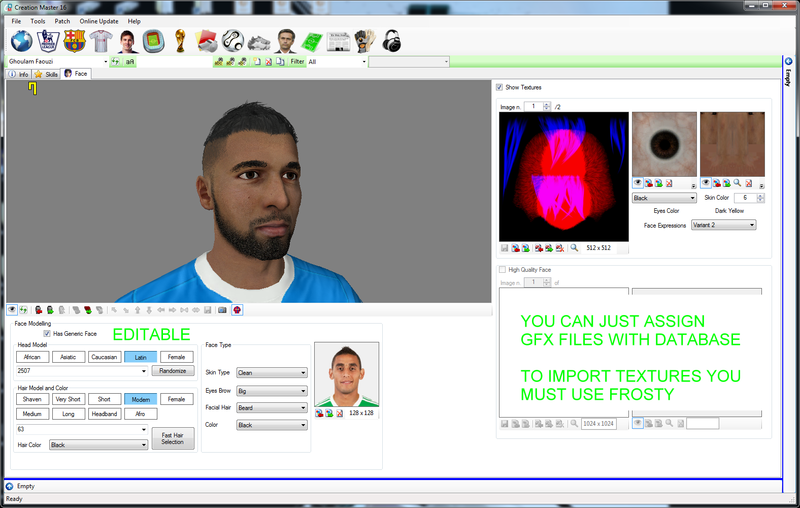 ready to import in a save squads file header (included) and load in game or use Moddingway FIFASquadFilesConverter. Also working to a new tool to generate save squads file automatically after import done. Don’t add text, rows or columns in template files!!! Files placed in main tool folder. Below other info about. Selection of these files is required once (next time use Open Recent). Edit db in the availables features, save your changes in CM16. – Copy the content of \CM16_DB_18\ inside your FIFA 16\ folder with all main big files and data\ui folder. 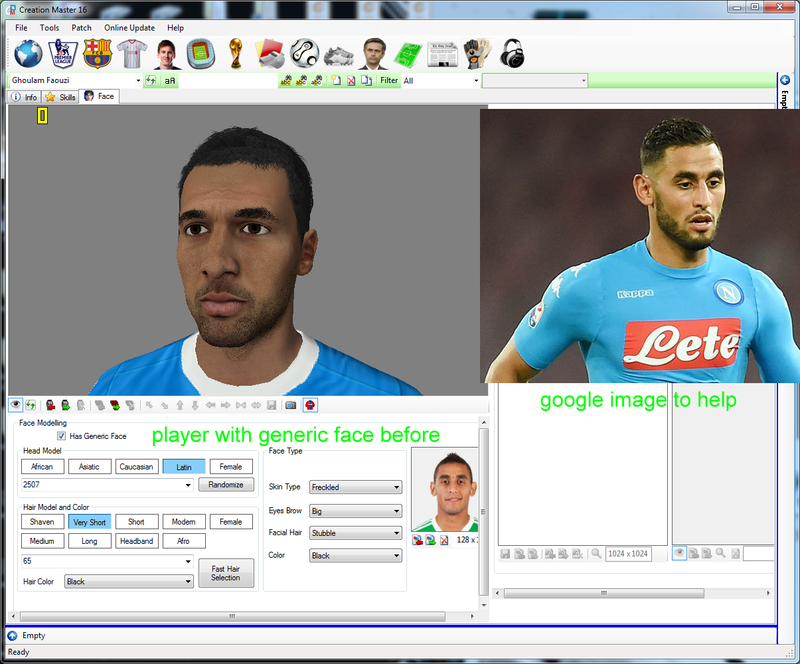 You can edit only players with generic faces, so check in the CM16. 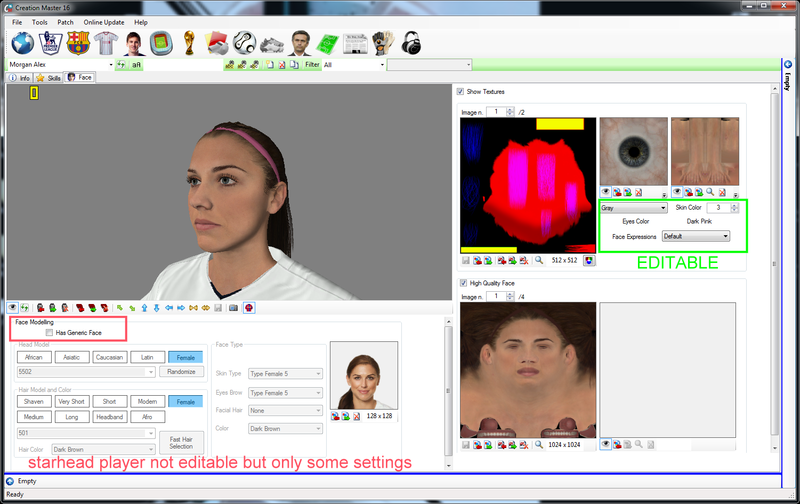 You can try experiments like get starhead player face and assign to another player by switching players ids, etc. To restore settings and template BASE_players.xlsx check at backup files. Or simple restore the 16_DB.db and then run script to regenerate templates. and then click OK to continue. Or simple don’t worry if not edited this table in CM16. In CM16 you can edit all that is included in players.txt database table (check video). or trasfer players (teamplayerlinks table). Open tables in Excel to check columns names. in the columns that the tool will add/use to convert to 18 format (columns DJ – DK – and from EC to EK). Anyway if importing back fails is there a problem in converted players table. The final converted table will be stored in \18_IMPORT folder and so open with Excel to find issues. 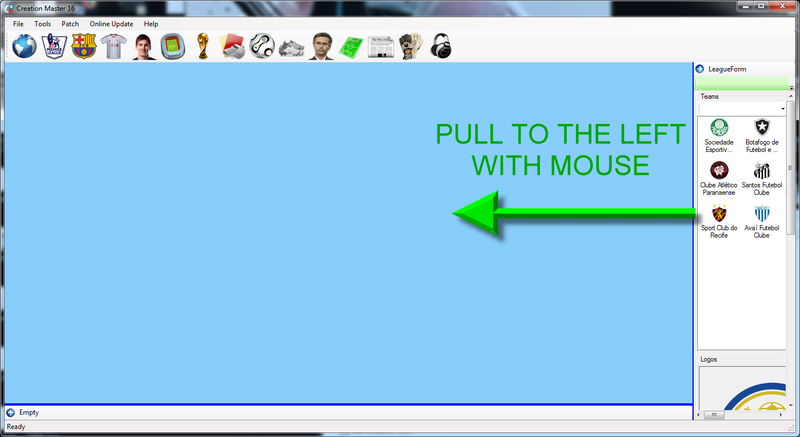 But I always suggest to edit and save the BASE_players.xlsx to make definitive tool settings. and for this reason you need to adjust yourself only the X column before you import back in 18 db. and use these 2 files like a debug to see issue in new added rows and just add 0 to columns but no empty values. Backup your BASE templates adjusted for your edited source db out from CM16. This first beta pack is suggested for experienced fifa db modders only. Anyway if you don’t need to create new players this first version works very well. In the future the tool will include also the full main db in the 18_IMPORT folder. Anyway the tool will work also with 18 main db (frosty exported). referees.txt table to edit refs attributes, faces and visual appaerence, fix names, etc. and just wait new DBM_ECI_T version that will convert and import new table in 18 db. Or convert yourself. and appaerence like beard, hair, height, etc. If you check my new ita refs you can see faces and body like pics from google. Just place “DBM_ECI_T” folder in C: \ or in another root drive. or just cut out “DBM_ECI_T” from all subfolders and paste in another location. to a player, game will still in the arena before match (if in teams is present a wrong shoe assigned to a player). 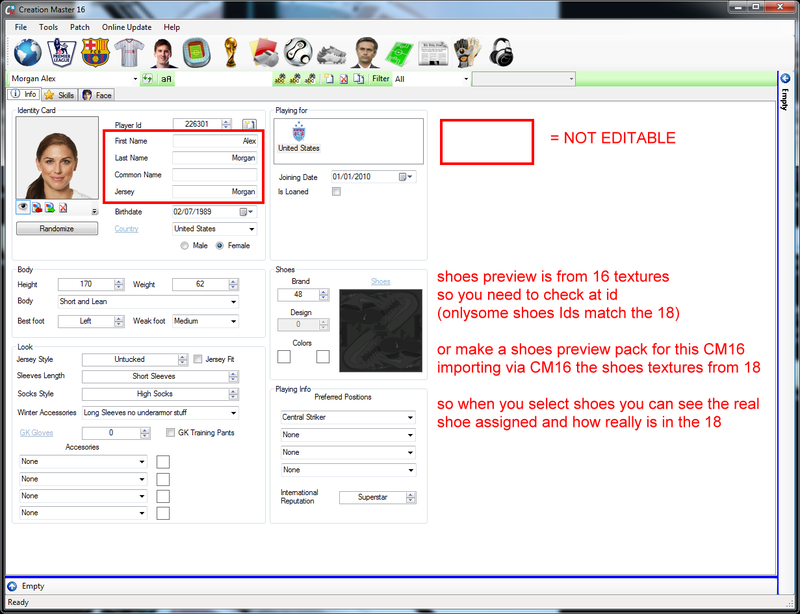 You can assign shoes only by checking at an already assigned shoe’s ID. Or map shoes, this is the best way (ID + a little 18 pic’s preview). hi, when do you put the new updated 16_DB.db? is it possible to make a tutorial? 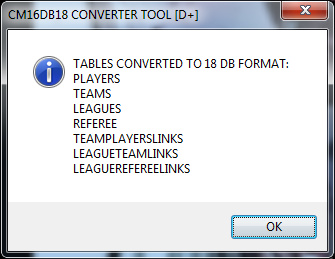 how do you put the new player tables taken from the file squad of the documents and put them inside 16_DB.db? You need fifa16, you need to make the edits in CM16 then import them into fifa18 and this tool if I understand it correctly. if this procedure did it automatically the program: from 18 to 16 would be much faster. save everything, I move the db file, I use the converter, but I do not load the rose and the names changed: why? I think you don’t understand. This tool is supposed to be FROM 16 TO 18, not vice versa. Doesn’t work for me like I stated on the youtube video. I put the edited fifa 16 database in the right folder, then launched the conversion tool but got an error that the temp file could not be written. Any new update? Would be great to add created players.